ahhh had not been updating this space for quite some time due to many many commitments. still rather busy, but am coming back to update on the results of the Nikkan Sports Drama Grand Prix for spring 2008. 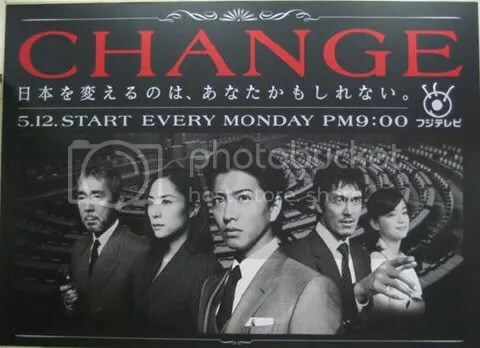 A total of 8350 votes were gathered during the 1st 10 days of the month, and Monday night series “CHANGE” swept two awards, Best Drama and actor Takuya Kimura won Best Actor with a wide margin. Best Actress was clinched by Yuki Amami, and Ryo Nishikido and Juri Ueno from “Last Friends” swept the Best Supporting Actor and Actress respectively. sorry guys if this update is pathetically short. i wish i had 40 hours a day. rawr. Fuji’s TV new dorama featuring popular actor and heartthrobTakuya Kimura is premiering in Japan tmr! It’s scheduled for the Monday slot at 9pm, and now i sure wish i am in the land of nippon right now, so I can catch Kimura with his cool cauliflower hairstyle in the dorama. Not your usual dashing style, Kimura acts as an elementary school teacher, who became the PM of Japan due to various circumstances. Kimura with a bunch of kids? Or him leading a nation? Pretty unthinkable i guess, but with his acting skills, we are bound for a good show. Not to mention that the script is handled by Yasushi Fukuda who had written past great dramas like “HERO” and “Galileo”. Change is the name. and Kimura probably will present a changed self in front of the TV set this time round for his fans. (: I’m looking forward to it, are you?